First time skiing? HELL YES! Although we didn’t hit the slopes for quite a long time, we are both long-term snowboarders and (even if it must sound reeeeaally strange in front of our mountaineering background…) didn’t try skiing at all so far. 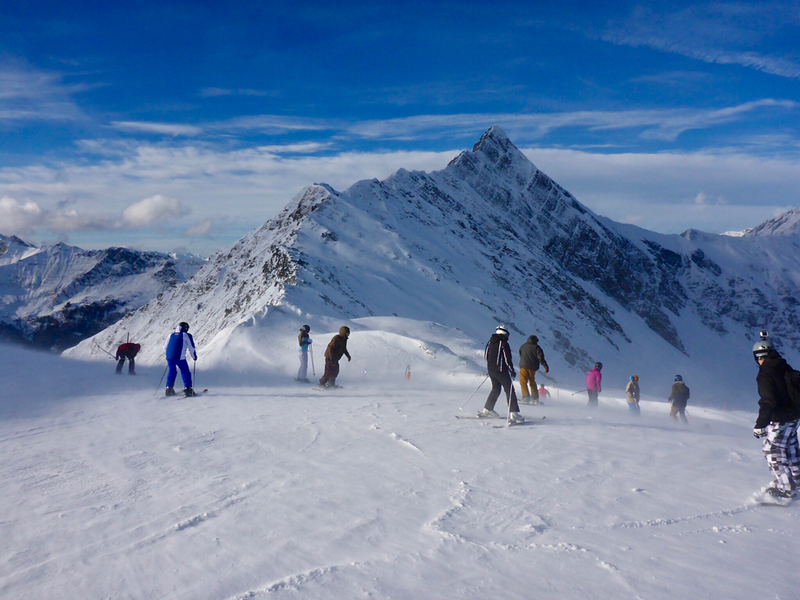 Hintertux is one of the closest ski resorts to Munich with guaranteed snow year-round and a mere 2 hours drive from our doosteps. It lies in Tyrol at the the end of the Zillertal in a beautiful side valley called Tuxertal, which is surrounded by mountains up to 3250m high. The weekend we chose to try our first steps on skis was good and bad at the same time: We had unexpected fresh snow overnight and a lot of sun, but almost 70 knots wind, which didn’t make it so easy. Fortunately we were accompanied by Stefan and Andreas, two snow professionals from the movie “Heimschnee”, who were our teachers for the day and really got us going! After a short introduction in how-to-put-skis-on, we were already in the chairlift up to the glacier. 🙂 The first curves were still in “pizza-style” and we were almost blown away by the wind, but after a short time we managed to ski (and not to slide) “french-frie-style” down the slope pretty reasonable. Can you see how WINDY it was? This hotel’s whilpool gives unobstructed views of the glacier by day and at night the sauna/wellness area made us really feel cosy. We were blown away by the hospitality and kindness and it is definitely A MUST to stay here whenever you should come to Tux. In friendly cooperation with Hintertuxer Gletscher and Hotel Klausnerhof. More information: www.hintertuxergletscher.at and www.klausnerhof.at – thank you!